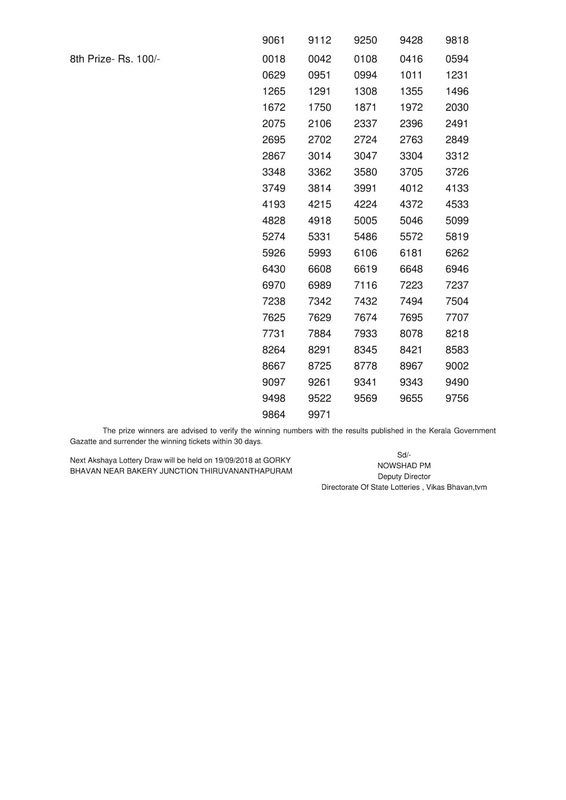 Kerala lottery result of "Akshaya AK-361" released on 12-09.2018. Live Kerala lottery result from 3:00 PM and the complete official kerala lottery result between 4:00 and 4:30 PM. Akshaya lottery is drawn on every Wednesday. Akshaya (AK-361) lottery first prize is Rs. 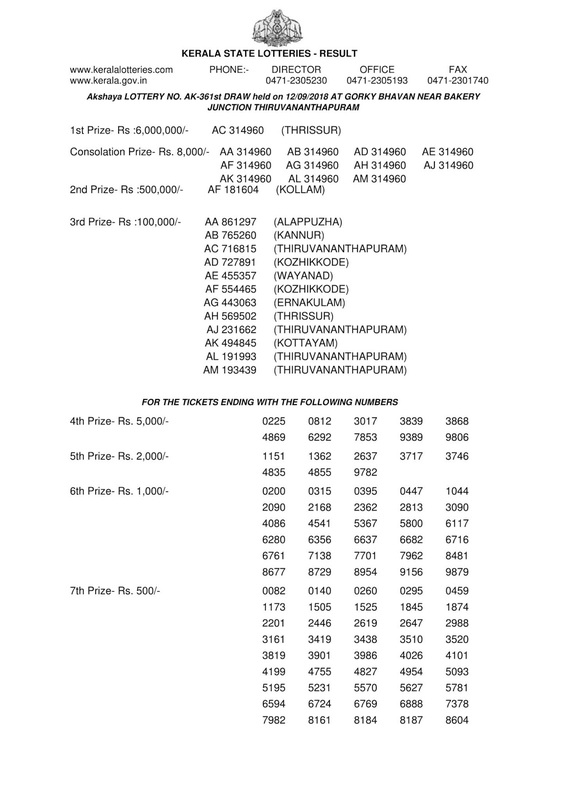 60 lakh for a ticket (common to all series) and the second prize Rs.5 Lakh for another single ticket (common from each series) and Rs.1 Lakh as third prize for twelve tickets (one from each series) of Akshaya AK-361 lottery. There will be 2,25,745 prizes provided and an amount of Rs.15,05,35,000/- will be given2out as prizes in the draw of Akshaya AK-361 on 12.09.2018. Lower prizes of akshaya ak-361 lottery starts from Rs.5000/- and ends Rs.100/-. One ticket of Akshaya AK-361 lottery costs Rs.30/-. Todya's Akshaya AK-361 lottery is printed in twelve series. 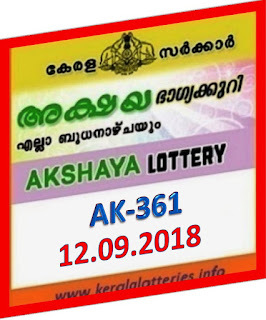 Kerala lottery result today on 12-09-2018 of Akshaya AK-361 will be published here. Kerala lottery result live starts from 3:00 PM and Official Kerala lottery results are published by 3:45 PM. 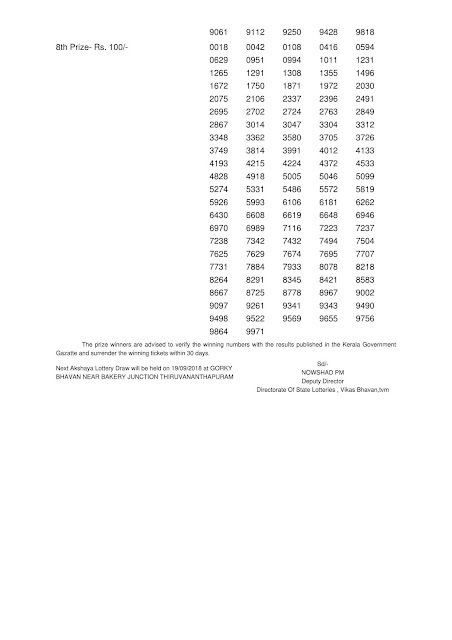 Find detailed Prize Structure of Akshaya Lottery.